I wanted to share some of my favorite Easter things. First up is new this year. 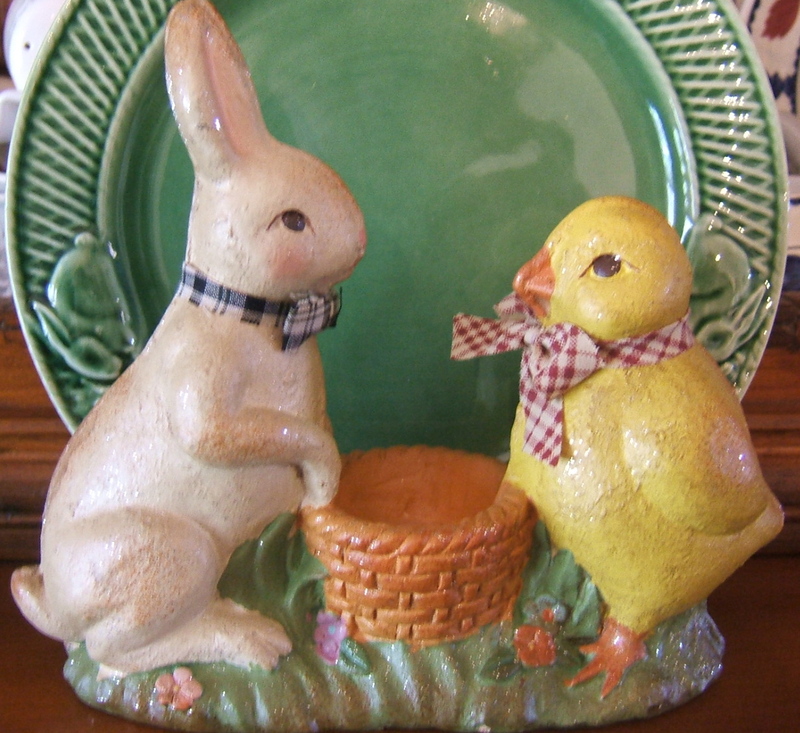 This vintage-looking bunny and chick grabbed my heartstrings when I saw them at Marshall’s earlier this season. I just couldn’t resist them. I love the vintage look they have and their coloration. While I tried to resist them, I just couldn’t do it. 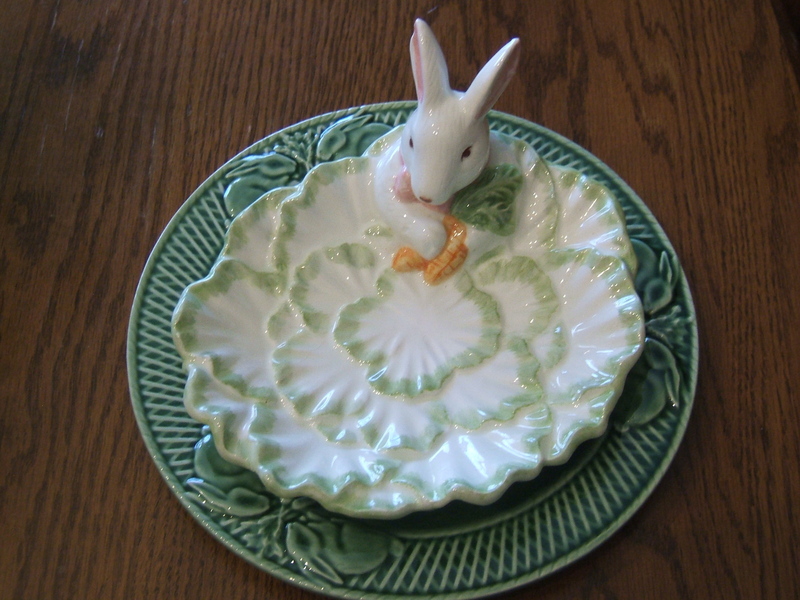 Next is the green Portuguese bunny plate on top of which I have placed a sweet rabbit plate. I love this little bunny who appears to be climbing onto the cabbage leaf with his carrot. Both of these are thrift shop finds. Here’s a close up of this sweet little guy. 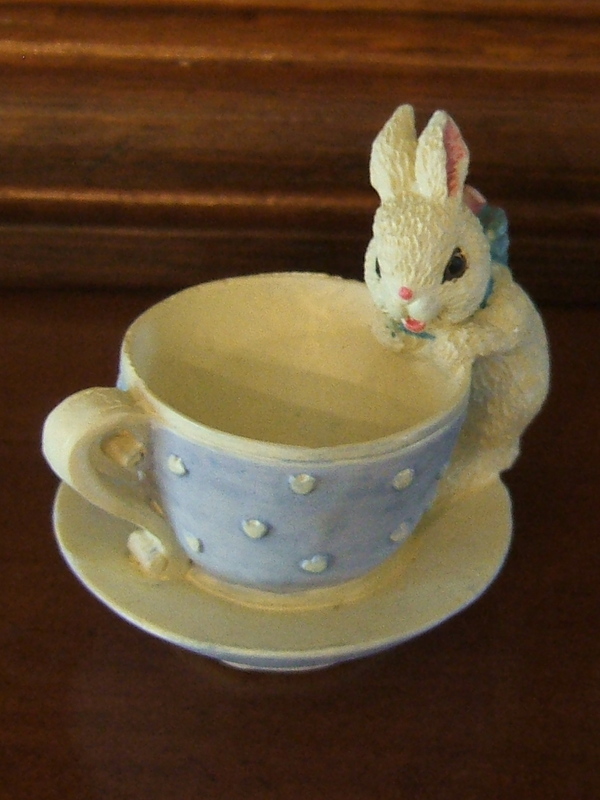 I was pleasantly surprised to find this tiny bunny “tea set” among my Easter decorations which have been boxed away for a few years. 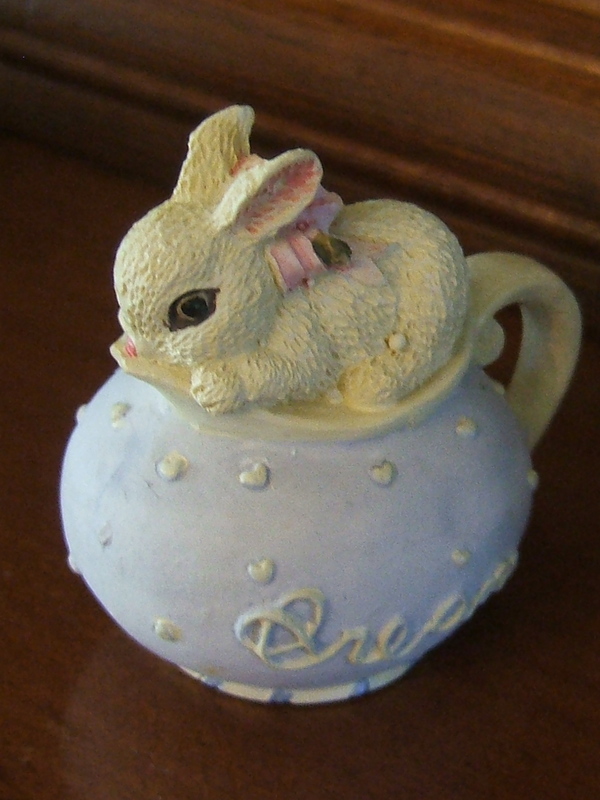 These playful bunnies are into everything, the creamer, the sugar and the two tea cups. Aren’t they adorable? 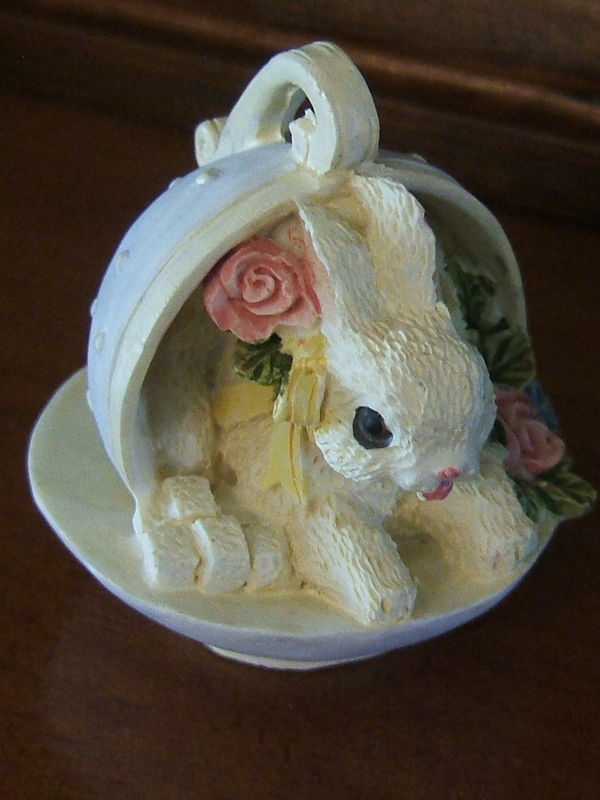 I have one more favorite vintage Easter decoration which I will be featuring in my tablescape this week. I hope you can come back to see what it is. I am linking up to A Stroll Thru Life for Marty’s Tabletop Tuesday and Favorite Things over at Bargain Hunting with Laurie. This entry was posted in Dishes, Garage Sales, Thrifting, Yard Sales. Bookmark the permalink. Oh, each one is just so adorable. They have the cutest, most innocent faces. I have to admit that that last little one peeking over the rim of the cup just steals my heart. What adorable Easter cuteness! that little teaset is so precious! I hope you and your family have a wonderful Easter! Happy Easter~~~have a blessed holiday! So, I’m not the only one who is rediscovering lost treasures! They are so cute! And I can see why the first one “hopped” into your shopping cart at Marshall’s. Way too cute to resist! And your suggestion about using my old cupboard for more dish storage was sheer GENIUS! I am totally going to do that! Thank you so much for suggesting that!!! Adorable Easter goodies! Love those little bunnies, glad you found them! Thank you so much for prayers for our area to get some rain. Thank you so much…. These are all so very lovely. Thanks so much for the follow..I look forward to checking in on you also. What lovely Easterness you have! 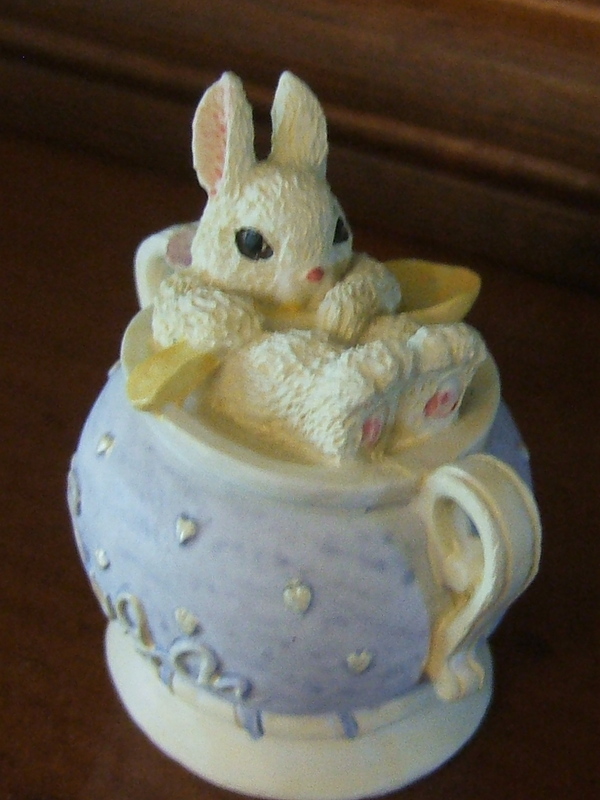 I have that little figurine with the bunny and chick. What a cute little tea set! Thanks for popping in to see me. 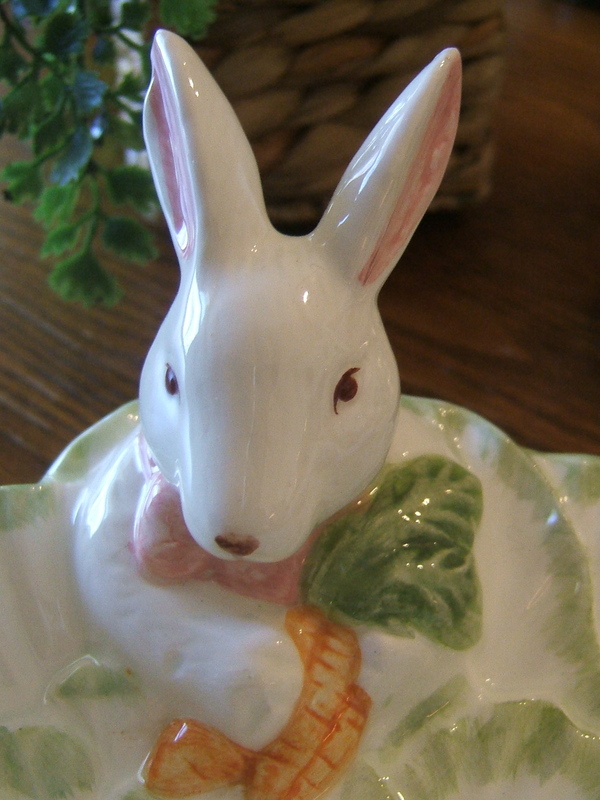 Your Easter treasures are delightful! All your Easter treasures are true treasures Tammy! Beautiful! Hi lovely lady. You have a Beautiful Blog I love the way you have put at all together. I am hoping you and your lovely family have Happy Easter.